hit or beat (something) repeatedly with a hammer or similar object. strike or knock at or on something violently with one’s hand or with a hammer or other object. inculcate something forcefully or repeatedly. What’s website hammering and how to spot it? Website hammering, originally derived from (“hard and persistent”) process of trying to connect to FTP servers in short period of time, nowadays includes all sorts of services, and can cause all sorts of availability and performance issues. In this particular case, it would be getting “hard and persistent” page requests. Do you check your web logs from time to time?! I know, none us do as often as we should, as browsing through them can be a mix of painful experience and eye-bleeding match-a-pattern game. Testing for “bots/crawlers” was fairly easy – a chunk of access log file [with request to a specific page] was submitted to an online log analyzer – LogCruncher. Crunched numbers disapproved hypothesis about bots/crawlers as 95% of all requests had different IP, and all those IPs were from ISP pools for standard users. So, the sources of traffic were regular users and their devices. A deeper inspection of traffic was required. 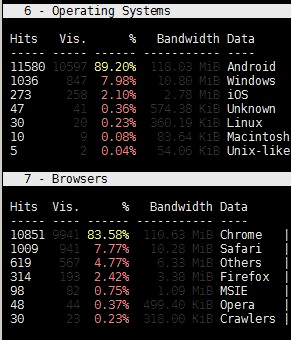 No patterns in missing traffic in Google Analytics could be found – all device categories, all manufacturers, all OSs, all browsers – they all had their share in Google Analytics, but still, a huge portion of traffic was missing. There must be a pattern, but it’s impossible to find it in Google Analytics. For further Apache logs inspection and I used GoAccess – nice little Linux utility that does just what I needed – groups requests by various dimensions – this might help me in finding the pattern. And it did help… most of the requests were from Android, and since there were more requests from Android than there were missing pageviews – it was a strong indicator in which direction further analysis should go. 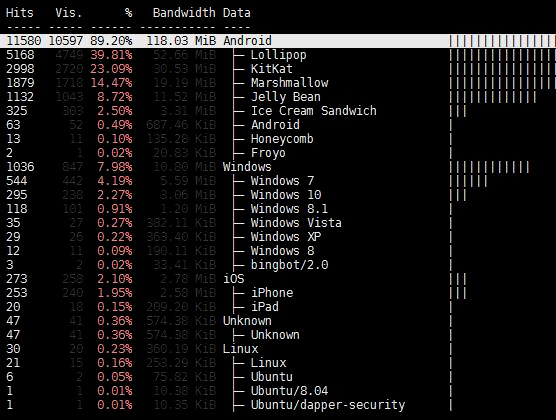 From that point the rest was relatively easy – observed traffic was reduced to Android traffic only, and the next two hints were spotted right on. These two hints also eliminated DDoS, since surge in page loads corresponded with link being shared on Facebook. A few quick tests were done – and it proved that FB in-app requests were tracked as usual – GTM and GA fired as usual, _ga cookie was set and used. Could it be that GTM/GA in FB in-app are blocked just on some devices, while firing regularly on others?! this one would catch those that have JS enabled, but have GTM/GA blocked using adblocker/router etc. I thought that I will finally get ~100% match between Apache logs and GA. The result?! Almost no increase! A slight, ~5% increase in number of pageviews in GA, so instead 10K vs. 3K, it was 10K vs. 3.5K – probably due to collecting those who block GTM/GA (well, I finally got GTM/GA blocking rate for the site ;-)). Benchmark image MP hit should be 10K, right?! Well – benchmark image GA property was showing 3.5K pageviews. That meant that FB in-app did not send request for a regular image on a page! Benchmark server-side MP: the only benchmark that was ~100% match with Apache logs was server-side MP call that was put in the main app code. No surprises here. So, a large portion of traffic was still missing, and I was stuck – there were no more information from the Apache log files that could be squeezed out, and I could not recreate situation where my traffic in Facebook in-app would be logged in Apache, but not in GA. I did not know whether this traffic is valid or not, should I block it or not, and blocking by User-Agent signature would have a large number of false-positives (this would block regular traffic as well). Test traffic on devices I made had the same HTTP referer and User-Agents had the same pattern [FB_IAB/FB4A;FBAV], but that traffic was tracked and visible in Google Analytics. I was not able to recreate something that was happening to ⅔ of visitors, no matter on how many devices I tested Facebook app. There was just one more thing to inspect – HTTP request headers. Made a little HTTP header request logging routine, and started collecting HTTP headers. And … bingo! These are the pieces that were missing to properly identify missing requests in Google Analytics. Puzzle-pattern is now complete! Facebook Android in-app sends SOME page requests with X-Purpose: preview header (and identifies as x-fb-http-engine: Liger), probably for prefetch/preview purposes [faster load for users]. Presumeably FB in-app has some internal algorithm (similar to Chrome’s prerender) that decides what will be preloaded and when. More on harnessing FB in-ap pressure and how browser’s prefetch/prerender can be used to speed up (Magento) sites will be covered in future articles – stay tuned! We all know that Magento CPU cycles come at a price, a hefty one. You should test on your own whether this FB in-app feature has implications on your web server performance and expenditure. How to test it on your site?! Here’s help for configuring Apache web server, something similar could be done with nginx as well. This will log all “Liger/preview” requests in a separate file which you can examine and make appropriate decisions on how you’ll be handling this type of traffic on your site. Please, share your “liger rate” in the comments below. Thanks! Hey! Thank you for research. 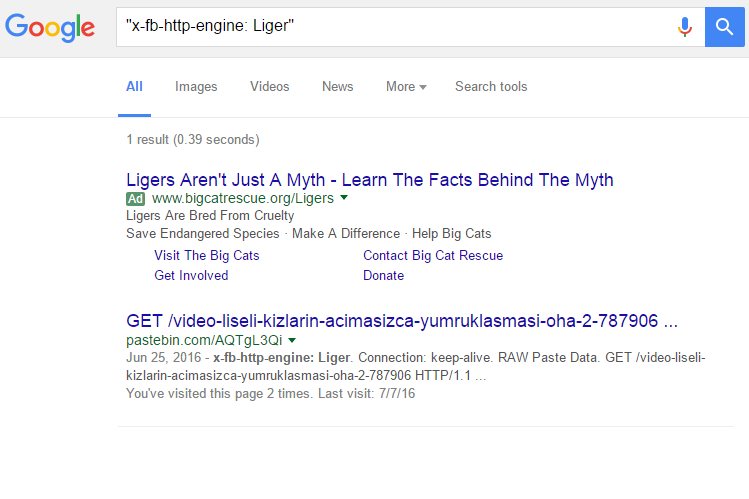 For the first time faced with “x-fb-http-engine: Liger” 3 days ago, when I noticed that site loads too slowly. As “nload” showed an average of ~100 MBit/s with a ~450 MBit/s maximum, the first thing I thought that is a DDoS-attack (because as usual blog transmit ~4 Mbit/s). The result of traffic analysis puzzled me — thanks to “tcpflow” I was able to find out that someone has shared/liked a GIF image from my blog and as result fb app just shows it to users and of course, they did not visit the site. By the way, image size is 1027,35 KB and as referrer is used “fbapp://350685531728/newsfeed_image_share_view”. ps. It seems the time has come again to enable hotlink protection. Good article, I’ve been looking for some time to solve this issue. More or less we reach the same conclusions, although I disagree on the possible solution. In my case what I do is by php save in the database every request, saving ip, reference, header and agent as well as time. Each time a request is made, the data is saved but the response http has a js code, which makes an ajax request to save or modify the registry in the database so that if it is possible to execute ajax I understand that it is A browser with these properties and I give it by real visit. I understand that the preload that facebook does not execute js, nor download images, etc, only download the pure html. I have saved the views from 18:25 to 18:42 only 17 minutes and 5446 requests have been produced, of which have loaded the js 232. I think it is not 100% a valid solution, in my case if I do that I would have lost 68 visits that in principle are real, because if they load the ajax that validates to be a browser with js active properties …, in principle we must understand that The precarca of pages does not load or interpret the js, another thing would be that really some preloads also load and interpret the js to advance even more speed … something I doubt enough. 68 over 232 in a few minutes is a very high percentage when comparing it mostly on a day, and considering that I have only done this on a section of the web if I do a server level crash I can lose a very high volume of visits. It seems very risky and drastic the solution. Does anyone know if Twitter does something similar? I can’t seem to find a reference to it in our logs, but based on some traffic stats, it feels like it may be happening there as well. Haven’t noticed anything similar. With not so much traffic originating from Twitter, it’s harder to spot any abnormalities. Hi Drazen, Thank you for this valuable article . we are suffering from this a long time ago , as we have a big Discrepancy between Google Analytics pageviews and Facebook clicks, for some articles Facebook shows that 10K clicks on a X link , but in Google analytics it shows only 6K for example . this particular FB in-app feature might not be connected with your issue… “FB clicks” vs Google Analytics incoming traffic is another story, in short – the discrepancy comes from Facebook’s terminology and metrics they use or each ad type. During the blackfriday our website suffered from an humongous amount of requests from the facebook app. Your article helped us identifying and tackling the problem. We initially tought it was an DDoS attack. We don’t use Magento, but the Liger requests of facebook caused us problems as well. Basically we are going to use the Headers of the request to determine if a session should be created or not. So, if I am understanding this correctly, it is better to block these traffic requests versus the latter? Are there any repercussions or penalties if you decide to let these roll through? Letting these requests through could cause server performance issues as each of those requests takes a part of server’s CPU/RAM/IO/bandwidth. The best way would be to test your “Liger rate” [see main article] to check how much stress these requests make to your server. Thanks for this Drazen, it proved extremely valuable for us in helping to identify the same issues and patterns we were seeing across our logs, although we hadn’t as yet boiled down to reviewing HTTP headers. To give you a steer on the impact for us, one of our sites went from 60k hits per month to 2.2m hits per month (primarily through FB ads etc.). An astronomical increase in requests, and ultimately demand we had to cope with. This sort of stuff does have a business impact and is wholly out of our control. We are now blocking the preview requests, until we decide whether we want to (not necessarily should) accept this traffic. I’m now rolling this out to some of our other sites in the hope that it will calm our traffic, and server capabilities down. I definitely owe you a beer! thanks on getting back with results (“liger rate”). I would appreciate if you share impact rate for other sites as well. So what we do next i got hammered by this kind of situation, and its killed my CPU really quick. I dont know if there is better solution for this. tnx for posting, but this would block all traffic from Facebook mobile app, including valid traffic. Later today or tomorrow I’ll post rewrite rule for blocking this exact traffic [Liger, preview]… Stay tuned! Thank you for sharing about GoAccess, I didn’t know about it. Works great! I see you listed the Apache config info, any chance you know what I would need to do for NGINX?